Every year I eagerly wait for the mango season to arrive. There are a thousand things that one can do to mangoes, both raw and ripe, but I’m sure most of you would agree with me that it is a sacrilege to eat this fruit in any other way than by just peeling the skin and relishing the flesh. With the sweetness of heaven and an unrivalled flavour, this king of fruits with unmatched taste reigns supreme in my heart. Although arguably, the best way to eat mangoes is as they are, they add splendour to a wide variety of sweet, sour and spicy dishes. A few years ago, a Gujarati family, the Shahs, invited us for dinner. After a lovely Indian Gujarati meal cooked by their maharaj (home cook), we settled down for a chat. When it was time for dessert and ice cream was on its way to the sitting room, Mr. Shah suddenly remembered “dudh keri” and requested his wife to make it. I followed the lady of the house to watch Mr. Shah’s favourite way of eating mangoes. She deftly peeled the outer skin of the mangoes and then quickly made vertical and then horizontal slits all over the fruit. She sliced off cubes of mango into a bowl and extracted the remaining flesh on the seed with her hands. Some chilled milk and sweetener was added and served. I became an instant devotee. I had watched my mother and grandmother do the same with bananas. The bananas were cubed and added to slightly sweetened milk and then eaten as a dessert or with chapatis. I suspect you can do the same to many other fruits. 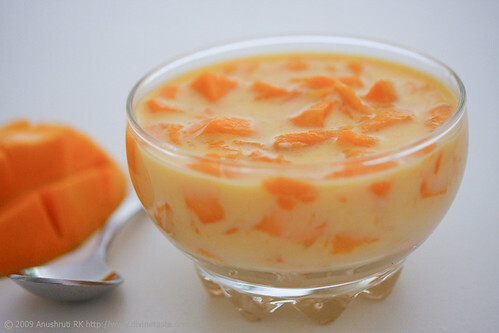 When mangoes are in season and you want a quick dessert, this is one way of making inroads into your heart! Use the measurements given below as a guide. You can vary the milk to mango ratio according to your liquid preference and adjust the sweetener to your liking. Use almond milk, oat milk, rice milk or any other milk of your choice for a vegan version. 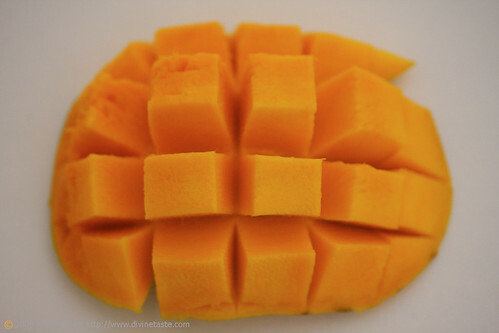 Place the cubed mangoes in a bowl. 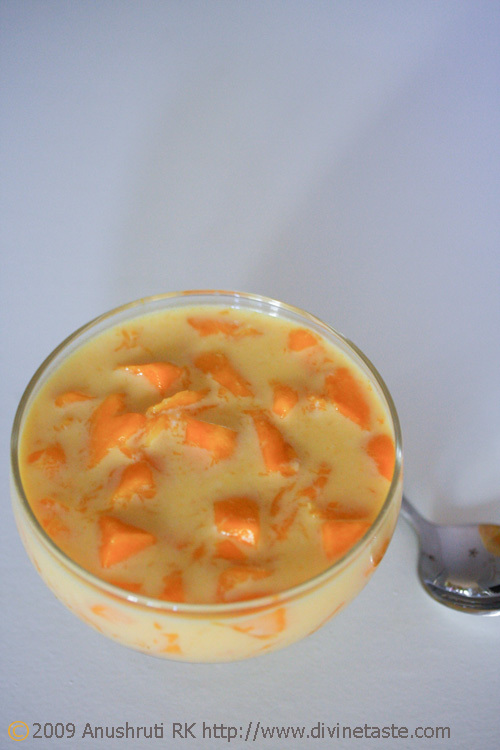 Mix the milk with either the sugar or the sweetened condensed milk, mash a few cubes and mix with the milk to infuse the milk with the mango flavour. Pour into the bowl. Chill and serve. You can use chilled milk if you want to eat it instantly. Yum Yum… just what I needed after a friday noon lunch! sad I can read and view the pics but not get to taste! Mmmm this sounds absolutely scrumptious! Its absolutely great Anu. The alphonso mangoes look delicious. Too bad that i am not in a position to make or eat this dish…..
hey anu….thanks for the recipe….got some amazing mangoes from alibaug yesterday…..was looking out for some good mango recipes….will surely try this! I'm always on the lookout for alphonso mangoes when they're in season. The orange flesh looks fantastic. Sadly the mango season is over. Anu, how about making it to siddapur next mango season? How about preparing your doodh keri right at neergudi. abraham: The mangoes are almost gone here. I'm glad you like my photos and posts. Can you give us the recipe for mango barfi.I am looking for one. I will try this as mangoes are available here right now in shanghai,where I live.